Puerto Rico today faces a serious debt crisis, recently defaulting on a bond payment. The proximate cause is a slowdown in economic growth since the mid-2000s, which has reduced tax revenues, and a declining labor market, where employment growth has been mostly in the red since 2007. There are many explanations for the economic downturn and the resulting fiscal crisis, but some commentators have incorrectly blamed the island’s high minimum wage. To be sure, the federal minimum wage—which has applied to Puerto Rico since 1983—is much more binding there than it is on the mainland. Because hourly wages are substantially lower in Puerto Rico compared to the U.S. mainland, the federal minimum wage policy affects more of the workforce there. In 2014, for example, the federal minimum wage stood at 77 percent of the median hourly wage in Puerto Rico, compared to 42 percent in the United States. For comparability with existing estimates, if we consider wages of full time workers only, these figures are approximately 70 percent in Puerto Rico and 38 percent in the United States, respectively. Finally, the minimum wage stands at 56 percent of the wage earned by production workers in manufacturing, compared to 38 percent in the United States. Clearly, the Puerto Rico’s minimum wage exceeds the cautious rule-of-thumb of 50 percent of median wage of full-time workers suggested by one of us in previous work. But does that make it a probable culprit for the island’s current debt and economic troubles? The short answer is: not very likely. The major problem with a minimum wage-centric explanation is timing. There has been no change in the relative minimum wage between Puerto Rico and the mainland over the past 32 years. 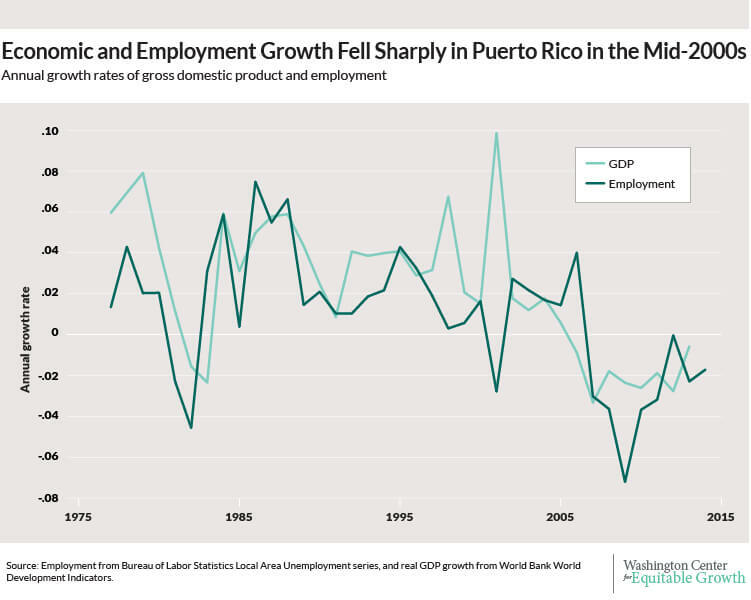 And since the federal standard has not kept up with wage growth on the island, the bite of the minimum wage in Puerto Rico has eroded over this period. First, the current inflation-adjusted value of the federal minimum wage is not higher than it was when Puerto Rico first adopted it. Puerto Rico’s minimum wage is worth slightly less today than in 1983, even though its economy, in terms of GDP per capita, has grown by 72 percent. Additional evidence suggests the current minimum wage in Puerto Rico is also less consequential today than it was during the 1980s. In 1983 the share of Puerto Rico’s workers affected by the minimum wage was around 44 percent, but by 2010 this share had fallen to around a third. It is difficult to explain the economic crisis in Puerto Rico starting in the mid-2000s with a minimum wage that is, if anything, on the wane. Finally, we should note that some recent reports have also incorrectly measured the level of the minimum wage in Puerto Rico, stating that a full-time minimum wage worker in Puerto Rico earns 77 percent of the nation’s per capita income, as opposed to 28 percent in the United States. Data from the World Bank suggests that although the ratio of 28 percent is correct for the mainland, the statistic for Puerto Rico is closer to 53 percent as of 2013, the last year in which complete data are available. Does this mean the island’s minimum wage has no negative consequences? It’s possible that the minimum wage led to somewhat lower levels of employment than would otherwise occur. After all, the minimum wage is much higher in Puerto Rico than the kind of increases we have studied elsewhere in the United States, where we find employment effects that are small and often indistinguishable from zero. But clear evidence of job losses due to Puerto Rico’s relatively high minimum wage remains elusive. 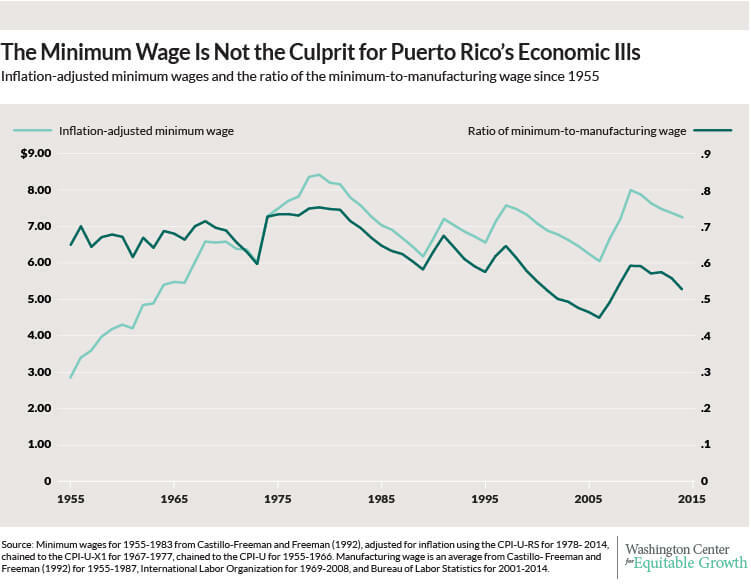 The two main scholarly papers on the topic reach different conclusions when analyzing the original Puerto Rican introduction of the federal minimum wage in 1983. In their 1992 paper, “When the Minimum Wage Really Bites: The Effect of the U.S. Level Minimum on Puerto Rico,” economists Alida Castillo-Freeman at the National Bureau of Economic Research and Richard Freeman at Harvard University found evidence of moderate-sized job losses by comparing unemployment trends over time, and by comparing wages and employment across industries on the island. Yet in a careful reanalysis of the same data in 1994, Princeton University economist Alan Krueger found that some of the findings by Castillo-Freeman and Freeman proved fragile. One case in point: the more negative estimates from cross-industry comparisons were in part driven by the over-representation of many narrow manufacturing industries in their sample. And there was some indication of the effects occurring, implausibly, prior to the actual increases in the minimum wage. Finally, while some of the episodes of minimum-wage increases on the island were associated with higher unemployment, the opposite was true during other episodes. Control groups for the Puerto Rican case are not easy to find, and so it is difficult to decipher what would have happened if the minimum wage in Puerto Rico were much lower. But, while there may be disagreement on whether the Puerto Rico’s minimum wage has caused the unemployment rate to be somewhat higher, both Professors Freeman and Krueger are in complete agreement today that it is unlikely either to be a major factor behind the current economic crisis, or an important part of the solution. Indeed, the long-run decline in the bite of the minimum wage presents a serious challenge for those arguing otherwise, since the timing of the crisis is inconsistent with minimum wage having played a real role in it. Reasonable people may differ on the costs and benefits of applying the federal minimum wage to Puerto Rico. But it would be misguided to expect minimum wage policy to provide a cure for the island’s ailments. —Arindrajit Dube is an associate professor of economics at the University of Massachuetts-Amherst. Ben Zipperer is an economist at the Washington Center for Equitable Growth.